The extraordinary wildfire season of 2012 has some lasting effects on the landscape, both in the immediate area and locations that may be several miles away. Locations downhill and downstream from burned areas are very susceptible to Flash Flooding and Debris Flows, especially near steep terrain. 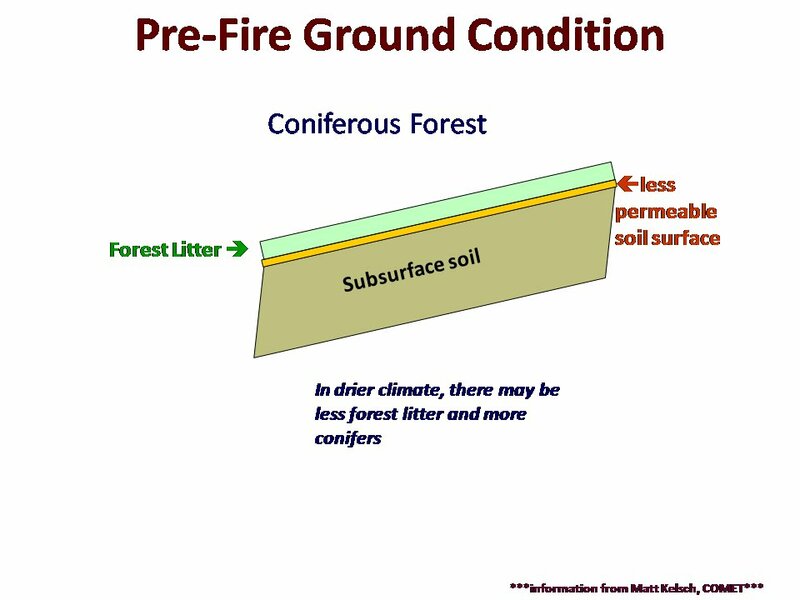 Rainfall that would normally be absorbed will run off extremely quickly after a wildfire, as burned soil can be as water repellant as pavement. As a result much less rainfall is required to produce a flash flood. A good rule of thumb is: "If you can look uphill from where you are and see a burnt-out area, you are at risk." erosion and pick up large amounts of ash, sand, silt, rocks and burned vegetation (Trees). The force of the rushing water and debris can damage or destroy culverts, bridges, roadways, and buildings even miles away from the burned area. In the event of moderate to heavy rainfall, do not wait for a flash flood warning in order to take steps to protect life and property. Thunderstorms that develop over the burned area may begin to produce flash flooding and debris flows before a warning can be issued. If you are in an area vulnerable to flooding and debris flows, plan in advance and move away from the area. There may be very little time to react once the storms and rain start. How much rainfall is required to produce a flash flood after a wildfire? The time required for a flash flood to begin depends on how severe the fire was and how steep the terrain is, combined with the rate of precipitation. Steep terrain combined with a severe burn scar and light precipitation can result in flash flooding within minutes of precipitation beginning. 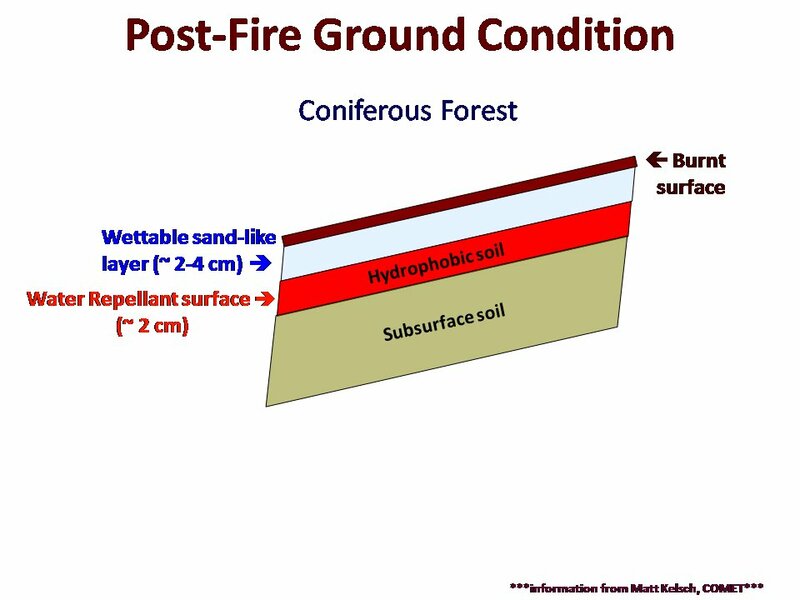 Areas of less severe burn damage and flatter terrain will be able to absorb more water leading to more time before flooding develops even in heavier precipitation. A general rule of thumb is that half an inch of rainfall in less than an hour is sufficient to cause Flash Flooding in a burn area, but this can be more or less depending on the factors above. The susceptibility to flash flood within the burned area is greatest during the first two years following the fire. The important point is that for any burn area it will take much less rainfall to result in flash flooding than it would have before the wildfire occurred. In fact, Thunderstorms that develop over burn areas can produce Flash Flooding and Debris Flows nearly as fast as National Weather Service radar can detect the rainfall. If heavy rainfall is observed even for a very short time there is the potential for Flash Flooding and/or Debris Flows. How long will there be an elevated risk of Flash Flooding and Debris Flows? This depends on the severity of the wildfire that occurred as well as how much erosion occurs. 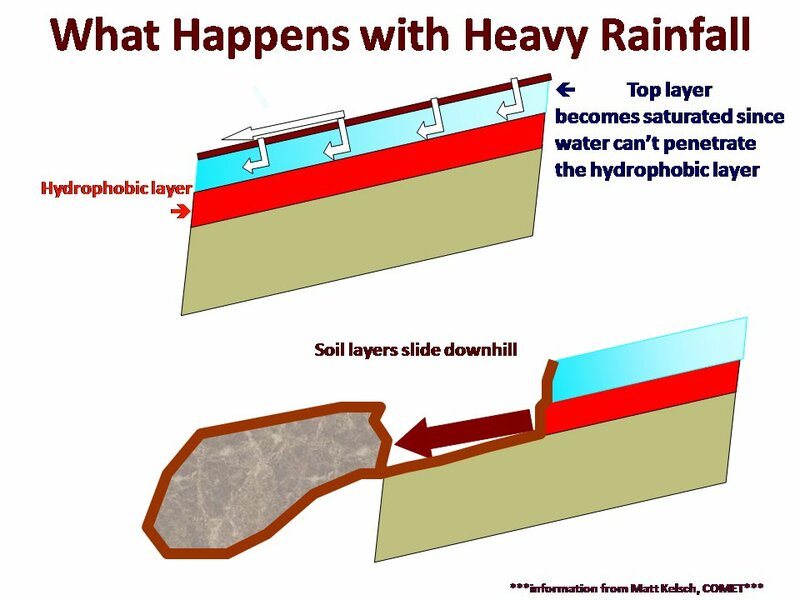 It could take many years for vegetation to become reestablished and this is the main factor in slowing the precipitation run off that creates Flash Flooding and Debris Flows. Most burn areas will be prone to this activity for at least two years. Each wildfire burn area poses its own unique risk of Flash Flooding due to many factors including proximity to population centers, burn severity, steepness of terrain, and size of the burned area. What should people who live near a burn scar do to protect themselves from potential flash flooding and debris flows?